Exploring space has always led us ambitious humans to develop new and interesting technologies along the way — and to collaborate like crazy. And that’s true for the latest project to send off a 30-million page library to the moon to in an effort to preserve civilization for the ages. “The massive archive of human knowledge etched into a DVD-size metal disc constitutes a ‘civilization backup’ to help ensure that our distant descendants never lose humanity’s collective wisdom,” intoned an announcer at NBC News’ technology site Mach. The 200GB “Lunar Library” is all stored on 25 nickel disks, each just 40 microns (one 600th of an inch) thick. “Because pure nickel doesn’t decay and has no half-life, it’s basically indestructible, even in space,” points out the How Stuff works website. 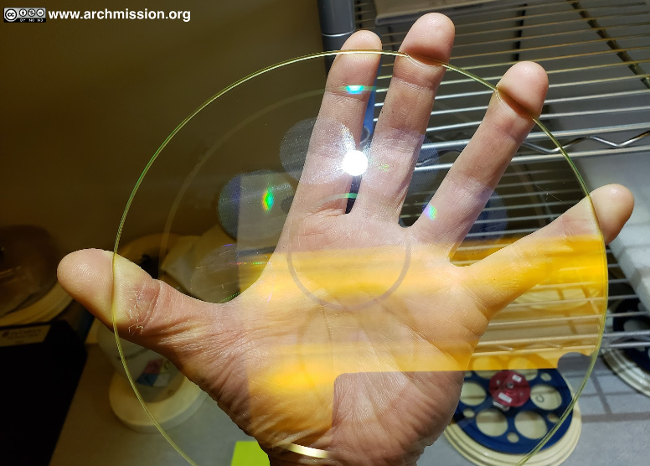 They add that the top four disks have been etched with 60,000 microscopic images, so the only thing necessary to decode and view them is the proper magnifying technology. The Arch Mission site notes that nano fiche is “a patented, proprietary product of NanoArchival, the first commercial spinout from The Arch Mission Foundation’s non-profit research and innovation initiatives,” and that after incubating the company, the Arch Mission Foundation became a “small founding equity partner,” with the hope that any success the company enjoys could help fund the foundation’s works of preserving the knowledge of civilization. Of course, the foundation is exploring other forms of storage, including molecular storage in synthetic DNA and encoding data as layers inside quartz silica glass. The site also lists artificial amber as a technology that’s “coming soon” — described as synthetic resins used to preserve DNA for long-term recovery. One of the tools the foundation wants to preserve? A nano fiche reader. The Arch Mission Foundation boasts an impressive list of partners including several universities and space foundations, as well as both Microsoft and the Paul G. Allen School of Computer Science and Engineering, and the Wikimedia Foundation. But it started with the dreams of two venture capitalists and serial entrepreneurs. 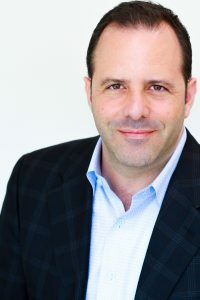 Nick Slavin is currently serving as the president and co-founder of Fuzionaire, (one of three companies he’s co-founded since 2016). Slavin started the Arch Mission Foundation with Nova Spivack, who has also founded or co-founded four different companies since 2016, according to his LinkedIn profile. But Spivak “has had a lifelong interest in space and the stars, perhaps in part due to the name his parents gave him,” says his official bio. At a young age, Spivak had attended an early launch of the Space Shuttle, and after earning a Bachelor’s degree in philosophy from Oberlin, he’d studied at France’s International Space University (where, according to his LinkedIn profile, he then earned a “Certificate of Space Studies” degree). “One of the early space tourists and space entrepreneurs, he has had a long interest in helping to facilitate the growth of a spacefaring civilization,” his bio notes. But the human collaboration was just beginning. In another first, the spacecraft carrying the Lunar Library to the moon in April also wasn’t funded by a government. The New York Times points out the relatively low-budget $100 million Beresheet spacecraft from Israel-based SpaceIL involved a lot of donations from philanthropists (including Las Vegas casino billionaire Sheldon Adelson), along with volunteer labor. Soon they’d formed a nonprofit, the Times reports, which was originally planning to build a cheap 12-pound lander to compete for Google’s $20 million Lunar X Prize (to be awarded to the first privately-funded team landing a robot on the moon before March of 2018). But by the time of the launch, it had swollen to 1,300 pounds (including fuel). And after eight years of preparation, their small spacecraft was finally lofted into space in February on the top of one of SpaceX’s Falcon 9 rockets (launching from Florida at Cape Canaveral’s Air Force Station). Three missions. Two of them on @spacex rockets. Hey @elonmusk – thanks man. The Times reports their plan as circling the earth in wider and wider circles, eventually dropping into a lunar orbit through “a long and winding, four million-mile-long journey,” even though the moon itself is only 238,900 miles away. Along the way, it will measure the moon’s magnetic fields. This isn’t the Arch Mission’s only attempt to back up humanity’s knowledge. CNET notes other triumphs — the quartz disk carrying a copy of Isaac Asimov’s Foundation Trilogy in the Tesla Roadster that was blasted into space in 2018, or the digital copy of Wikipedia carried by one of the miniature satellites from SpaceChain, the ambitious open-source satellite network. And earlier this month the Arch Mission Foundation announced that it is also teaming up with Hypergiant Galactic Systems to launch a series of satellites around the solar system in 2020 to create an Interplanetary Internet, equipped with sophisticated AI systems to target data broadcasts to the other space-based internet nodes in real-time. And using blockchain-powered data synchronization, the satellite system will perform its first proof-of-concept test using the Arch Mission Billion Year Archive. CNET reports that the Arch Mission Foundation also plans to establish archives on Mars — and deep down in earth’s underground caves. The first disk could be read with a magnifying glass, though the next three disks require 1000X magnification. These four disks are considered the “analog” layer and include a time-capsule from SpaceIL describing the culture and history of Israel, along with songs and drawings by children, plus a “Primer” from the Long Now Foundation that uses pictures to teach over a million concepts with their corresponding word in major languages. Then there’s an instruction manual for how to read the rest of the disks — “a series of documents that teach the technical specifications, file formats, and scientific and engineering knowledge necessary to access, decode and understand, the digital information.” In the project’s official white paper, one file is described as “The Arch Foundation SpaceIL Mission ReadMe”. But we already know that the mayor of Austin, Texas added a delicious recipe for queso, reports the Austin Chronicle, in a digitized letter which also informs aliens and future civilizations that Austin is “way cooler” than Hollywood and New York. 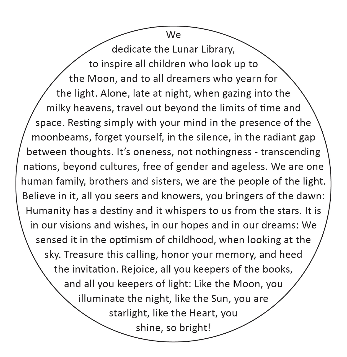 The Lunar Library itself has also provoked some wry comments. “Any aliens who come across it in the future will surely be baffled by a few choice entries, like ‘moon-landing conspiracy theories,’ ‘flat Earth’ or ‘Tide pod challenge,'” jokes CNET. If you want to leave a message such that in millions of years, if there is a spacefaring civilization on Earth, the message will be discovered by them, the Moon is one of several logical places to put it. Two new planets discovered using artificial intelligence. A Silicon Valley company makes it possible to drive a car remotely. McDonald’s plan to use AI to tweak drive-thru menus and make smart fast-food recommendations. Prisoners in England will be taught to code.